Walker Cahall is an illustrator, designer, maker, teacher, and worldly thinker based in Portland, Oregon. He loves to ride bikes, go on adventures, and collaborate. Inspired by robots, galaxies, woodblock printing, national parks, computers, fractals, and the smell of rain, Walker is currently an adjunct professor at Portland State University and runs a Collaborative Maker Space called Magnetic North. Have you designed a stamp before? What unique challenges did it present? I have never designed a stamp before, It was a really fun challenge of thinking small. 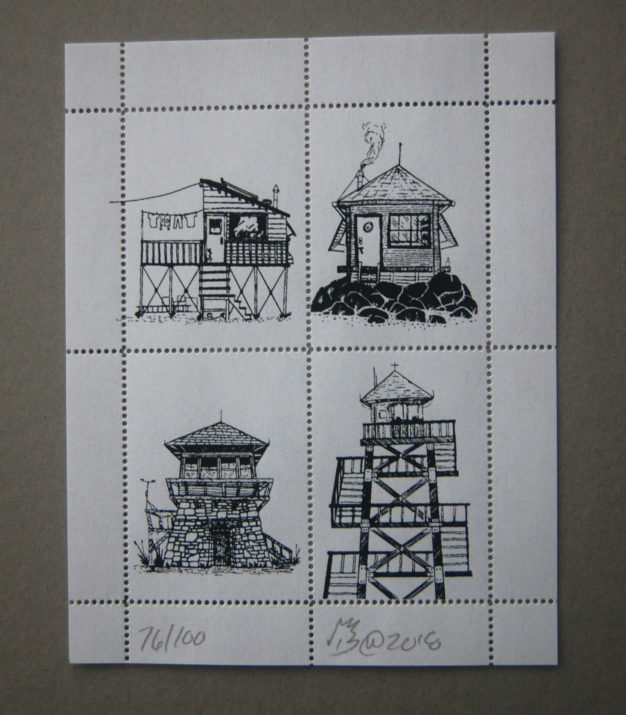 The amount of detail in traditional stamps is really high, essentially you get to design a very small poster. The challenge of knowing the right amount of detail to add coupled with a unique aspect ratio made this design a little bit more challenging then normal. From a printing standpoint, this is about the smallest that can be reliably silkscreened. Originally my image was a flood of color with the ranger station knocked out, but I was worried that they would fill in when I did the silkscreen printing. Even then, I had some trouble with the slightest lines. What was the most interesting or fun aspect of designing a poster stamp? I really liked the paper, it had a wonder tactile quality and was fun work with. I also liked the framing and puzzle aspect of creating the imagery at that scale. I repurposed an existing digital illustration that I create in procreate, I had to do some fine tuning to make sure my details could come through, and I had to vectorize the imagery to make sure that I could get a high quality burn for the silkscreen process. Each stamp was made with love!